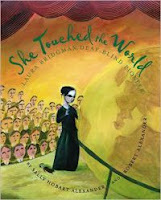 You know about Helen Keller, but have you ever heard of Laura Bridgman? Laura was born about 50 years before Helen and actually taught Annie Sullivan to fingerspell. Laura was born strong and healthy, but when she was a young child she contracted scarlet fever, a disease which robbed her of her hearing, sight, and most of her senses of smell and taste. The world was silent and gray, but Laura proved to be unstoppable. She was intelligent and always curious, exploring everything and touching everyone. When Laura went to a school for the blind, she quickly learned to communicate. She was delighted to be able to communicate with the people all around her and her questions were nonstop. Her sense of touch was so fine that she could identify different people by the vibrations of their steps. She could feel dirt and lint on her clothes. And now she could fingerspell, read raised print, and write. Laura became famous for what she could do, for the obstacles she had overcome. People all over the country knew her name. And once you read this book, you will, too. I thought this was a fascinating biography about a person I knew nothing about. I first heard of this book through Sarah Miller, the author of Miss Spitfire. I was intrigued because she was so enthusiastic about the book coming out and I was not disappointed. Tons of photographs accompany the text, making it feel like you just stepped into Laura Bridgman's world. The authors talk about the assistive devices available at the time, like a metal grid with boxes that was used to help blind people do arithmetic or a board with raised lines on it that helped blind people write on straight lines. At the end of the book there's a section about the authors' research and about how life is different for Deaf-Blind people today. There have been many, many advances in technology that help people with disabilities and, most importantly, attitudes about disabilities have changed. Hand this one to fans of Helen Keller or anyone looking to read an interesting biography. Happy Nonfiction Monday! Anastasia's got the roundup over at Picture Book of the Day. Go check it out. I'm glad you enjoyed this -- Laura deserves more fans. Plus, it's a darn good bio.